Vikas Khaladkar who served as the Crown counsel with the Newfoundland and Labrador Department of Justice and Public Safety, is now a judge with the St. John’s-based trial division of the Supreme Court of Newfoundland and Labrador. Justice Khaladkar began his legal career in Saskatchewan, which is where he resided after his family immigrated from what was British colony of Tanganyika, and focused primarily on First Nations law. He was the first general counsel for (what is now known as) the Federation of Sovereign Indigenous Nations, and represented the federation in negotiations leading up to the Charlottetown Accord. He also acted as its counsel during agreements related to gaming jurisdiction and on-reserve policing. Justice Khaladkar is known for successfully arguing one of the first Charter cases heard by the Supreme Court of Canada. The case, R. v. Therens 1985 S.C.J. No. 30, dealt with the right to retain counsel upon detention or arrest. In 2007, Justice Khaladkar was offered a position as a Crown attorney in Newfoundland and Labrador. He has resided and worked in the province ever since. 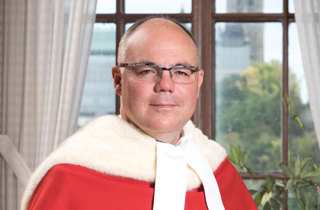 In his role as a Crown, he has prosecuted cases at all levels of court, including the Supreme Court of Canada. He replaces Justice Richard D. LeBlanc, who elected to become a supernumerary judge effective Sept. 26, 2017.